Fermentedly Challenged: 4-Packs the Wave of the Future? 4-Packs the Wave of the Future? By now, most beer enthusiasts have heard about the current hop and malt shortage going on and how beer prices are going up in 2008. What you might not have noticed is a trend by craft brewers to "trick" you into not noticing the higher beer prices by putting out some of their brews in 4-packs instead of 6-packs. While the standard may still be 6-packs, 12-packs and 24 (cases), there's going to be a growing trend to keep you trying and buying craft beers in smaller quantities - 4-packs. Perhaps 4-packs are the way brewers are going to get you to try new brews without having to buy an entire 6-pack. Nothing is worse than trying out a new beer and having to invest in an entire 6-pack only to find out that you don't really like that beer and end up giving away or throwing away several bottles of beer you don't like. For us, the beer experimenters, we love nothing better than to try out as many different beers as possible. Another reason for 4-packs is the fact that some specialty beers are quite expensive to make and to require consumers to buy an entire 6-pack might cost them over $20. Breaking it down to a 4-pack seems a bit easier on the wallet. I for one like to buy sampler packs. These usually come in 12-packs. Samplers usually have between 3 to 6 different beers to try with 2 to 4 duplicates of each beer. Even with a 12-pack sampler if you didn't like several of the beers you still got stuck with all those extras. Well, now you can lower your risk and try out some 4-packs. Here are two examples that I've seen come out this year. 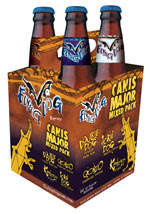 Flying Dog Brewery has just announced their Canis Major 4-pack sampler of their Big Beers. Beers that are hoppier and higher in alcohol content. This 4-pack will have 1 each of their big beers: Kerberos Tripel, Gonzo Imperial Porter, Horn Dog Barley Wine and Double Dog Double Pale Ale. Not a bad little gimmick for getting you to try their brews without investing in a big 12 pack. 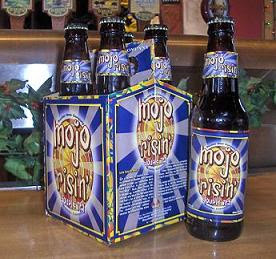 Another brewery who is putting out a 4-pack is the Boulder Beer Company with their Mojo Risin' Double IPA. This beer is going to be a bit pricier anyway since it's a limited release so why not cushion the blow to the wallet by putting them into 4-packs? A couple other brewers putting their beers in 4-packs: Great Divide (Yeti Imperial Stout), Dogfish Head (90 Minute IPA and others), North Coast Brewing (Old Rasputin, Old Stock Ale). The trend seems to be more common with higher alcohol beers. I'd hate to think that all craft breweries are going to start going this way to give the appearance that beer isn't going up in price. But let's face it. Our beer is going to cost us a bit more these days and probably will so for the next several of years. Hop crops can't keep up with demand and they can't be doubled in a year as it can take several years for new hop farmers to come on board with decent crop yields. Then again, perhaps having more 4-packs out there will allow us beer lovers to try even more beers without having to invest a lot of green. I'll drink to that.